And a cracking, ‘easy’ time was had by all…. 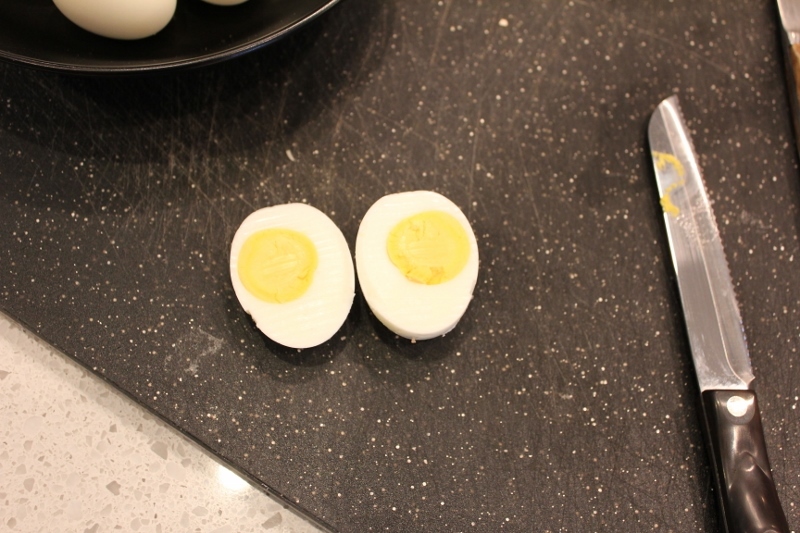 Enough was enough…or should I say en-oeuf already? I haven’t blogged forever. I kept meaning to get back into it but life got in the way and I am still struggling with the time involved with getting a post just right. 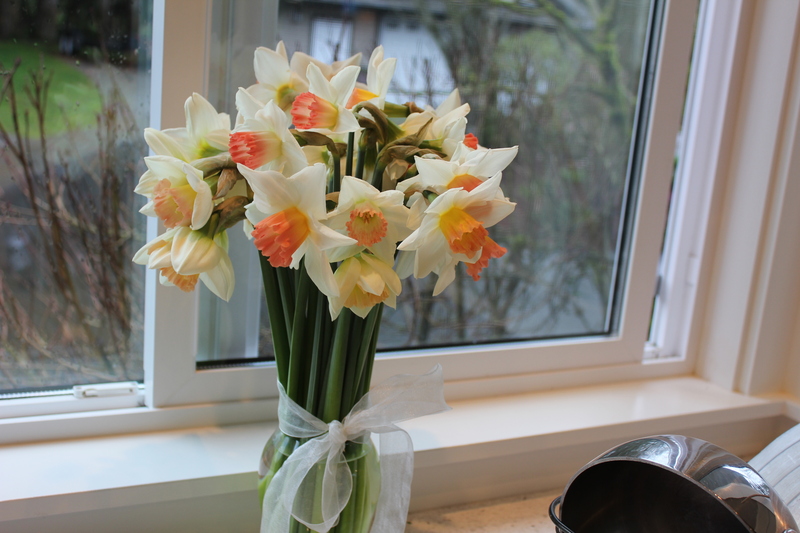 As other bloggers know, it’s a commitment and I just can’t come to grips that I should just type and play around with pictures when there are sooooo many things to do…. But en-oeuf already… Its Easter Sunday and I thought there was no day better than today to do a post about eggs. Not just any eggs, but our backyard ladies’ eggs. They started laying awhile back and we are still getting double yolkers from 2 of them. The rest of the girls are laying medium-eggs. But what this post is about is hard boiling them. 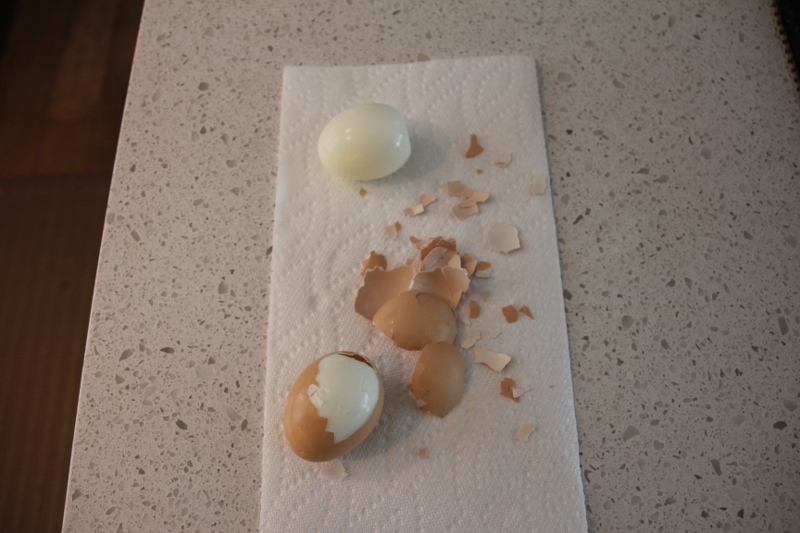 As a lot of you know, when you get a fresh egg and you decide you HAVE to have a hard boiled one… the shell is a HUGE problem to remove… well not HUGE, but an irritating process and you get little bits of eggshell under your finger nails… it’s that problematic and even somewhat painful. 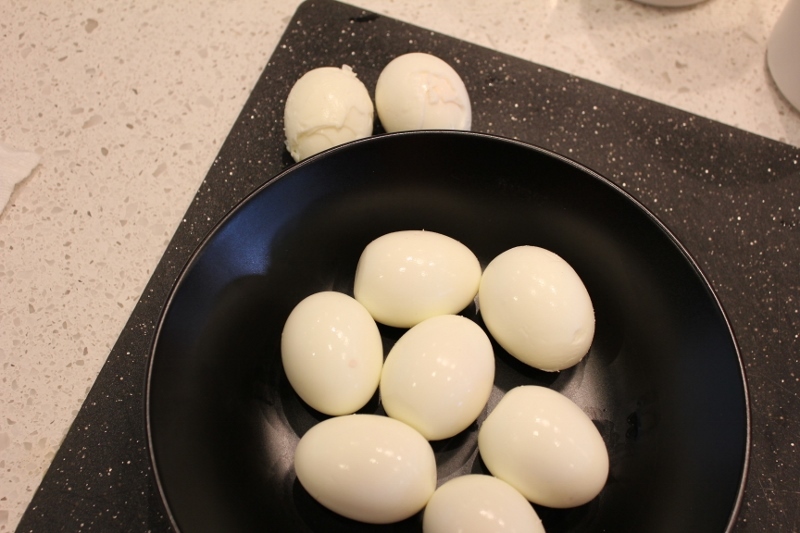 I follow Serious Eats on Facebook and one day they posted about the only way to peel fresh hard boiled eggs. I was intrigued. Every cook complains about this so I was a bit skeptical. But I am never let down from their posts. The trick is to have your eggs cold. And your water boiling… rolling boil. Add eggs. Then an immediate turn down to simmer. 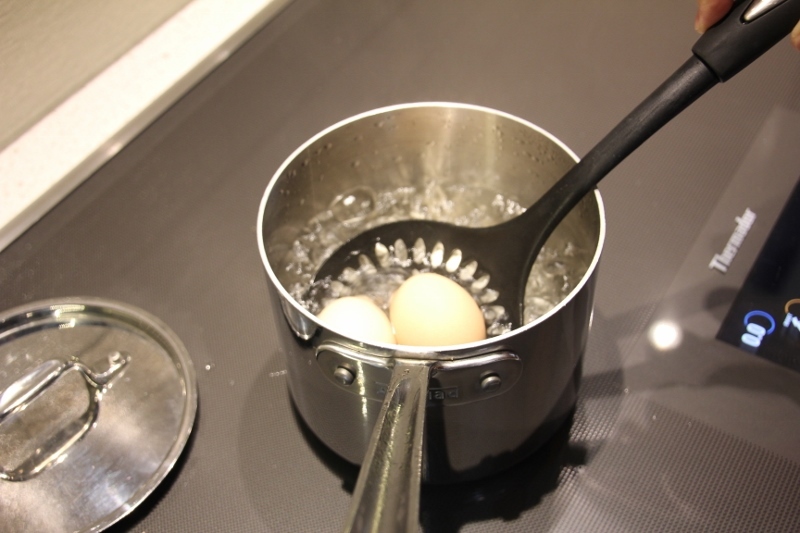 For soft boiled, 6 minutes and for hard boiled, 11 minutes. Then immediately into an ice bath. Success rate is between 80-90 percent. Every time. I tested it 3 times before I told anyone about it. 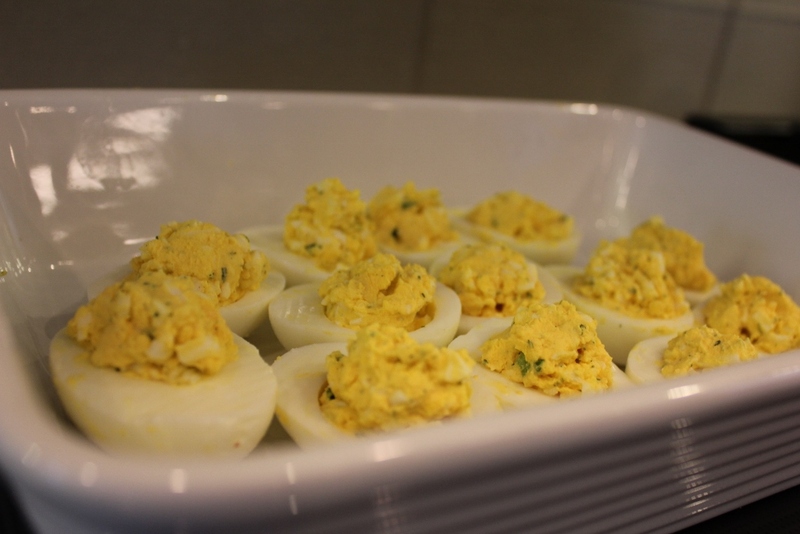 Then I started making devilled eggs again. 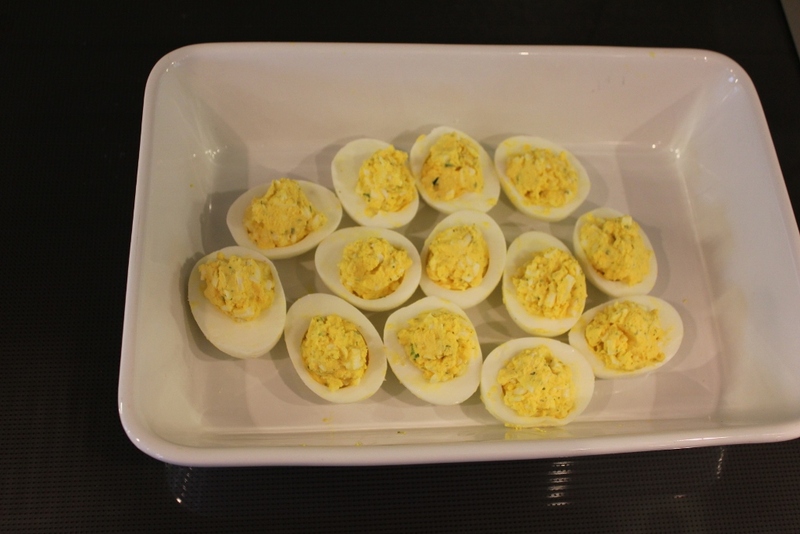 DC loves them but with fresh eggs and the peeling pain, I had stopped making them. 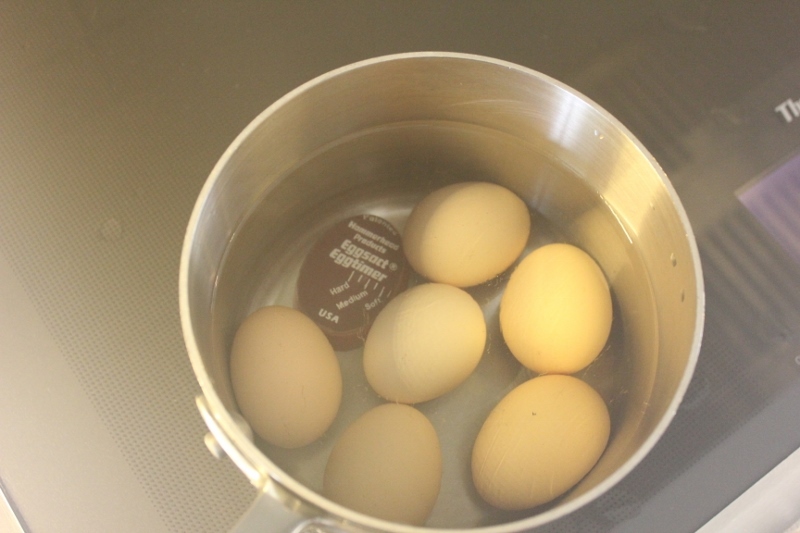 I use an egg timer disc for doing eggs but if you don’t have one, just follow the 6 minutes for soft and 11 minutes for hard instructions from above. 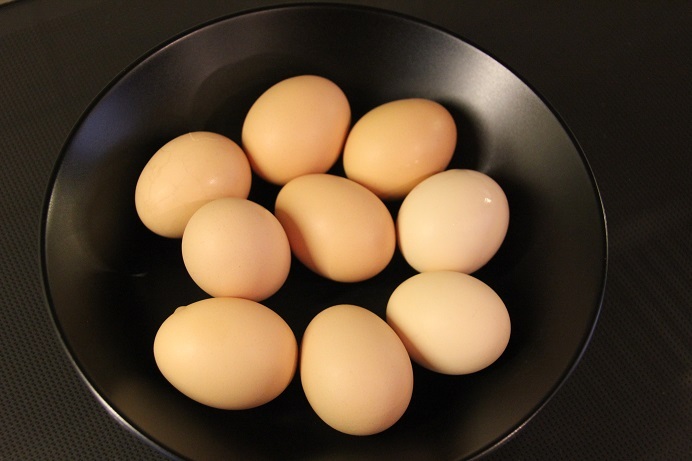 Gently drop your cold, fresh eggs into the boiling water. 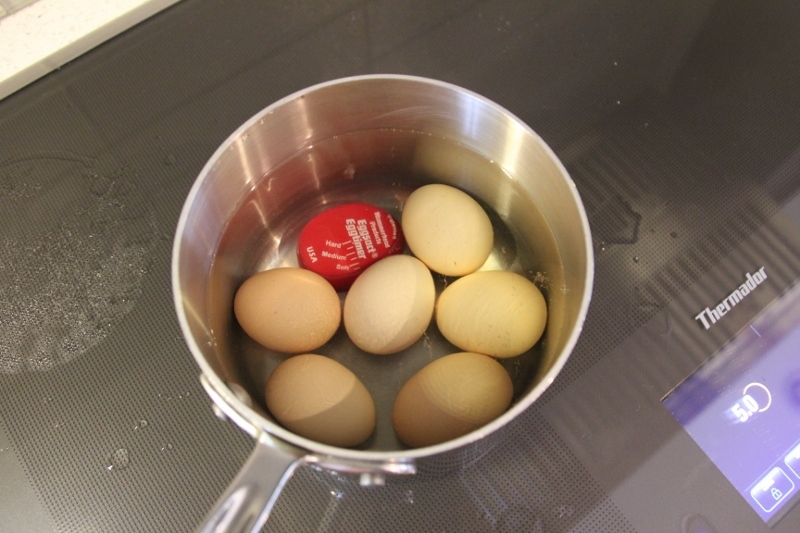 When the eggs are ready, the disc is solid dark red. I forgot to take pictures along the way so you could see the red colour changing from bright red to dark red…. but you can imagine the idea…..the colour goes dark from the outside to the inside. 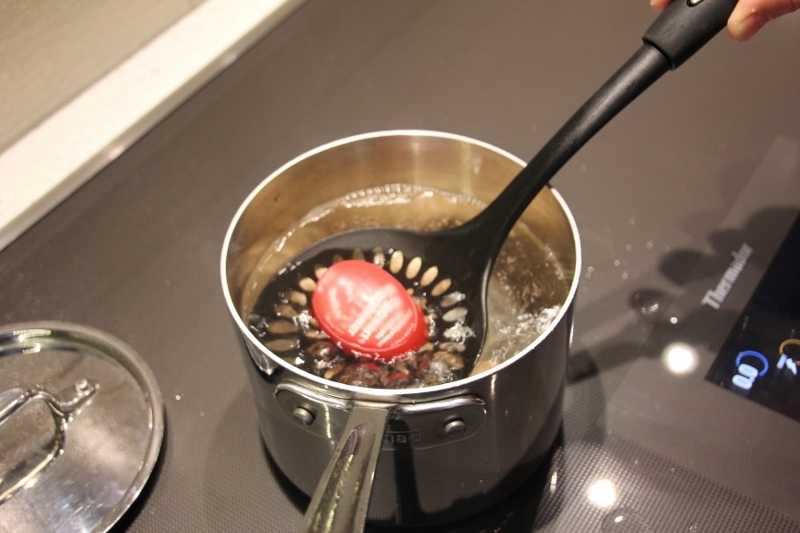 Then I use the same strainer spoon to gently place the eggs into the ice water. Wait 15 minutes and you have eggs ready to use. Let the peeling begin! 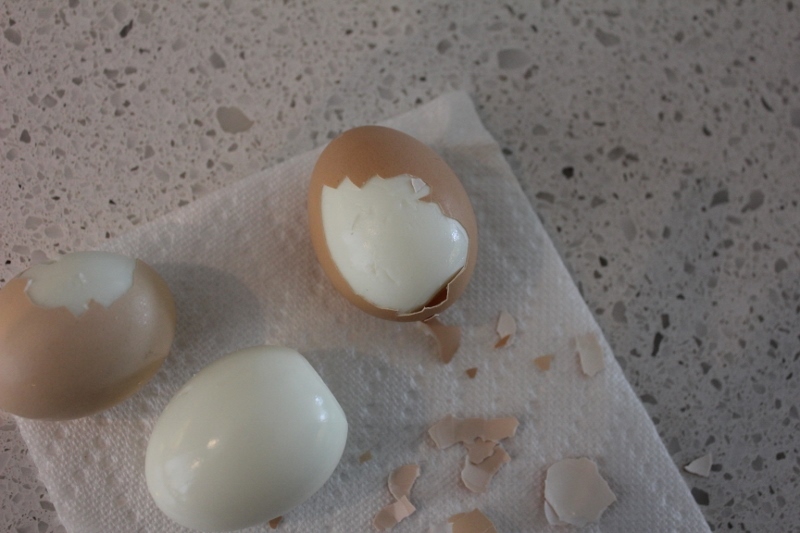 It’s quite remarkable actually… after years of struggling with the shells, they basically just slip off like a non-fresh egg. 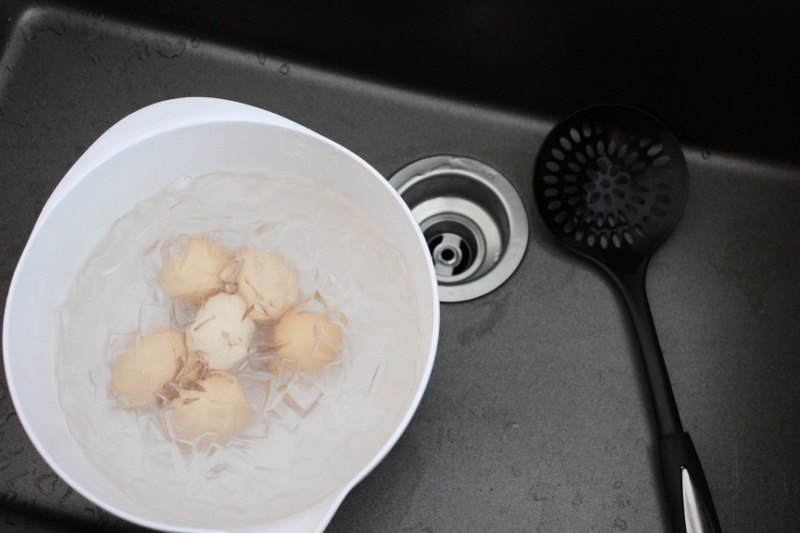 I think the theory is that the shock of the cold egg meeting the boiling water and then meeting the shock of the ice at the end, shrinks the egg to produce the gap between the membrane and the shell. 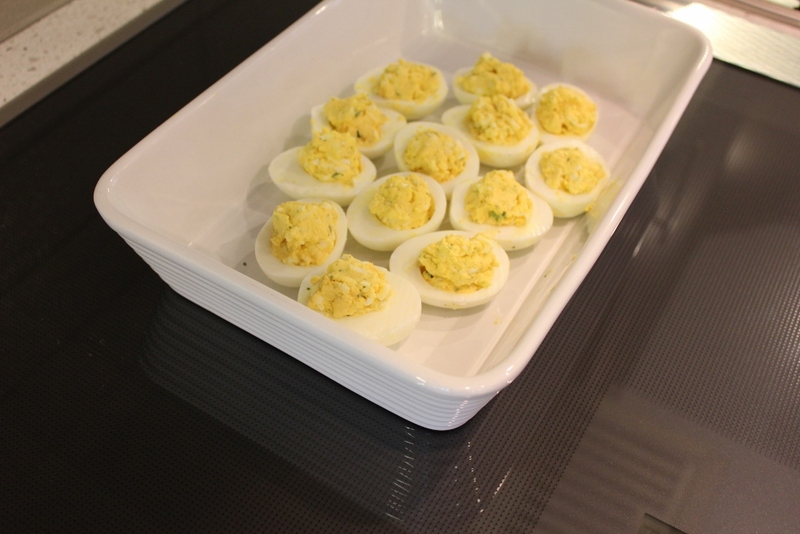 Success rate is between 80 and 90 percent, so with the ones that don’t make the devilled egg cut, I just add to the yolks for the filling. Works like a charm. Bring the 14 cups of water to a boil. Boil for 2 minutes. Remove from heat. Add tea bags and sugar and stir to dissolve sugar. Cool the tea completely. Tea that is too hot will kill the SCOBY. While the tea is cooling, get area prepared: clean surfaces, clean bottles, clean any spoons, clean measuring cups, clean a plate. If soap is used, rinse really well as soap can affect growth. Ideally just use very hot water and sterilize everything. Get your bottles ready to take the new batch of kombucha. Metal kills kombucha. Don’t use metal lid or store in anything but glass. 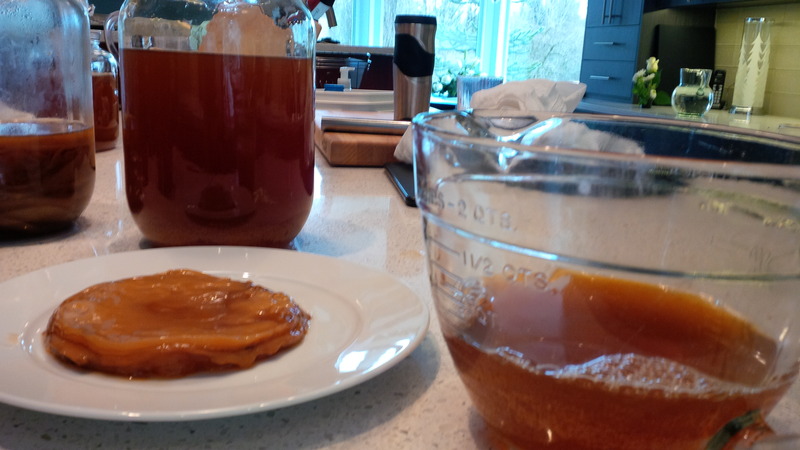 Bring out last weeks brew and gingerly remove the SCOBY from the batch and place on a plate. Remove yeast if too much has grown. The yeast is the brown hairy things that are growing and sticking to everything. Measure out two cups of the kombucha and set aside. Pour remaining Kombucha into bottles. I don’t carbonate mine as I prefer room temperature, non-carbonated kombucha. Others bottle with pop tops and the kombucha then carbonates. BE AWARE… that when you do this, you create a champagne like environment and I have also inadvertently sprayed kombucha all over the kitchen… you want a brewery smell? that is a sure way to get one…. 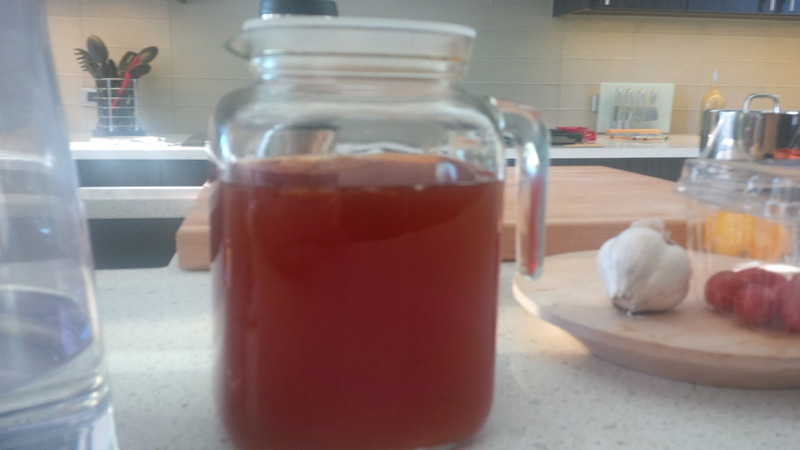 Pour tea into gallon jug til about 3/4 full, add SCOBY, add the 2 cups reserved tea from previous batch. It should fill up until the ‘shoulder’ of the jar. You need a bit of room for expansion of the SCOBY. Cover with paper towel and an elastic band or a piece of cloth. Don’t use cheesecloth as fruit flies know how to get through cheesecloth. 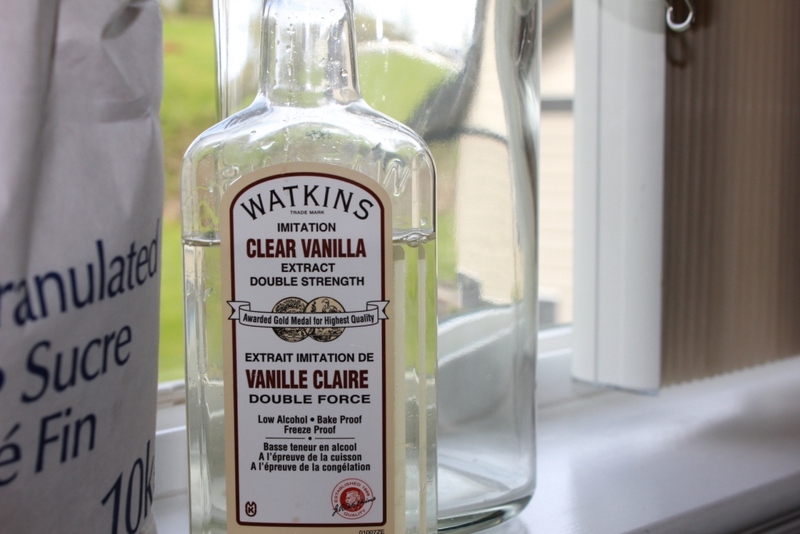 Invest in some jars you want to bottle with. I purchased a very great jug at London Drugs for $7 that has a rubber twist seal on it. We leave it on the counter and keep the kombucha close at hand so we drink frequently. 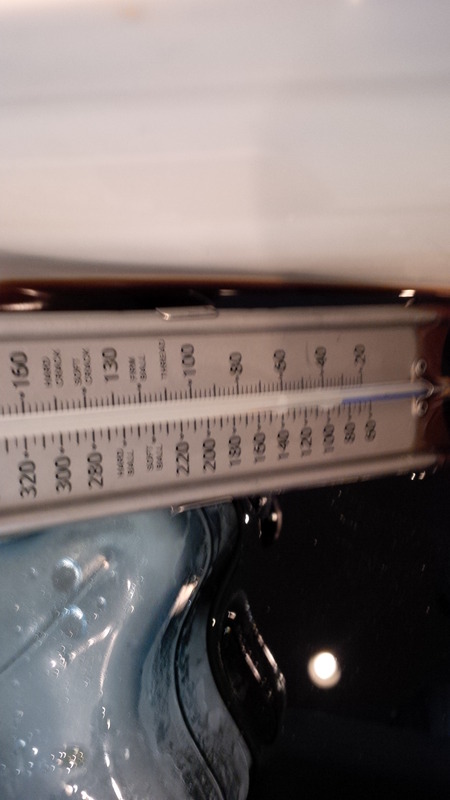 Keeping it at room temp also means that it continues to grow. If you put in fridge, it will stop growing. 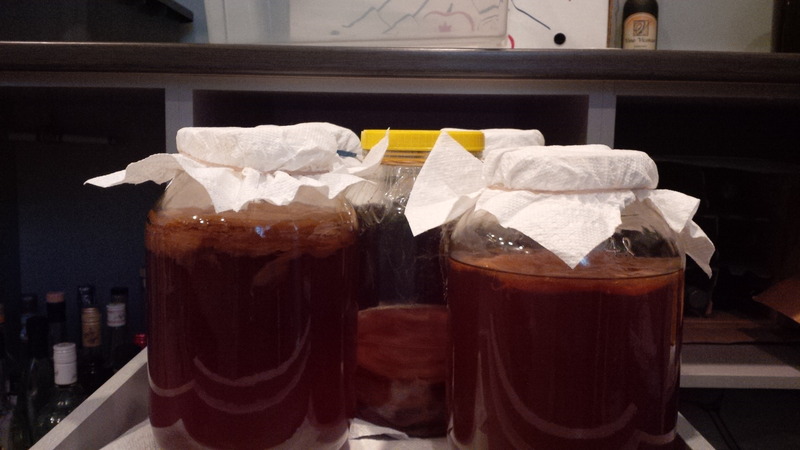 Growing means that you will always get the start of a new SCOBY as slimy scum on the top of your kombucha. I just chuck these little guys into the compost. I make kombucha each Saturday morning*. 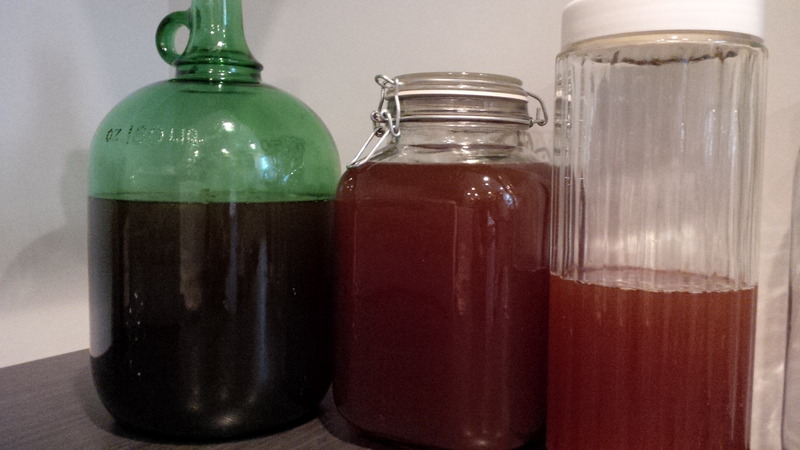 I have a warm environment to store it in so our batches grow quick… and we like the taste of 1 week kombucha. 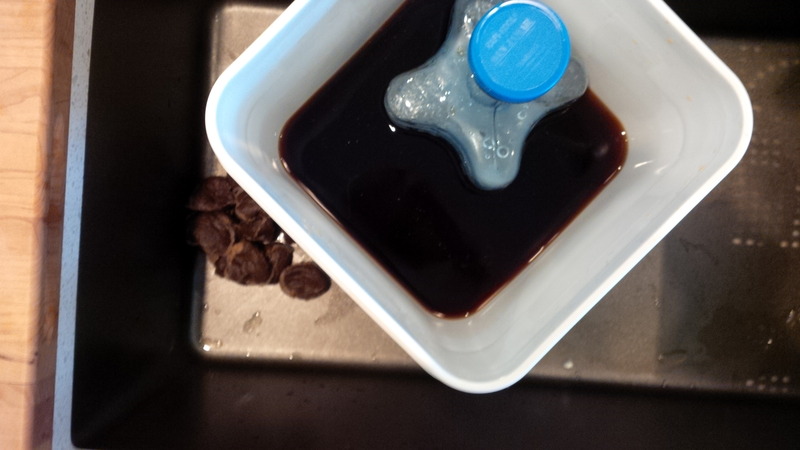 Others brew for 2 weeks and it becomes much more vinegar like as the sugar gets all eaten up. You will find your happy medium. It should not be too sweet. The longer the brew, the healthier for you supposedly. Less sugar, less caffeine and the like. Other instructions and observations suggest a variety of methods and tips: -Don’t move the jar too much for the 1 week – 2 weeks it’s brewing -Use tea that does not have too much oil ie. earl grey -A few bags of herbal tea can be added for a different taste experience -Without too much disturbing, ensure the SCOBY continues to be covered in the tea and to not get too dried out at the top -Green tea works but the batches seem to take longer -When bottling, flavours can be added… ie… herbs, fruit etc. *Update April 3 2016. I am now brewing every 2 weeks. The process is taking longer because I started using tea that was less fermented to begin with. I now am mixing jasmine, oolong, white tea, 1 or 2 bags of orange pekoe and 1 herbal. These teas take longer to ferment a batch but I get a lighter product at the end. When I just used orange pekoe, it went quite quick. *Update June 9 2016. I added mint leaves to the 2nd ferment. This is the stage after brewing with the SCOBY. Bottle the Kombucha in large glass containers with lids, add fresh mint leaves and let do an additional ferment for a few days. The flavour is fantastic. I am trying blueberry mint and ginger mint. *Update January 26 2018 I started using the basket type coffee filters with an elastic to cover the jars whilst fermenting. They stand up better than paper towel. 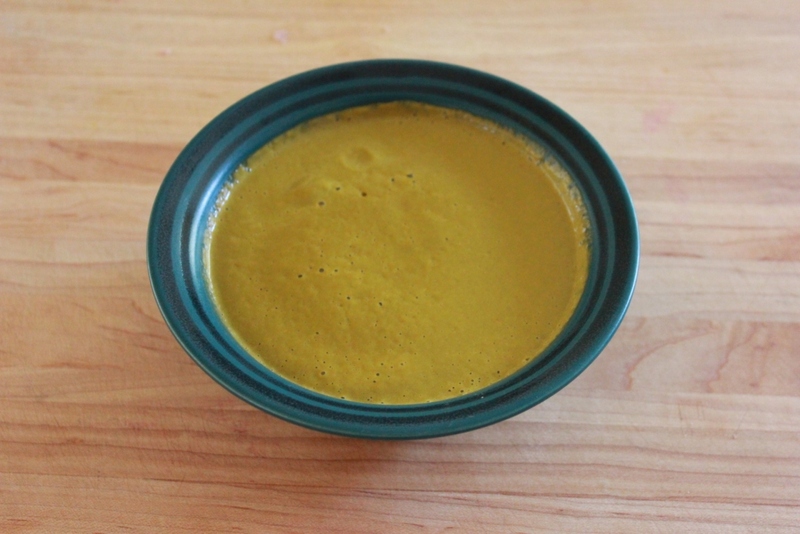 During the winter I also added some chai to the first ferment and this made for a very nice taste. 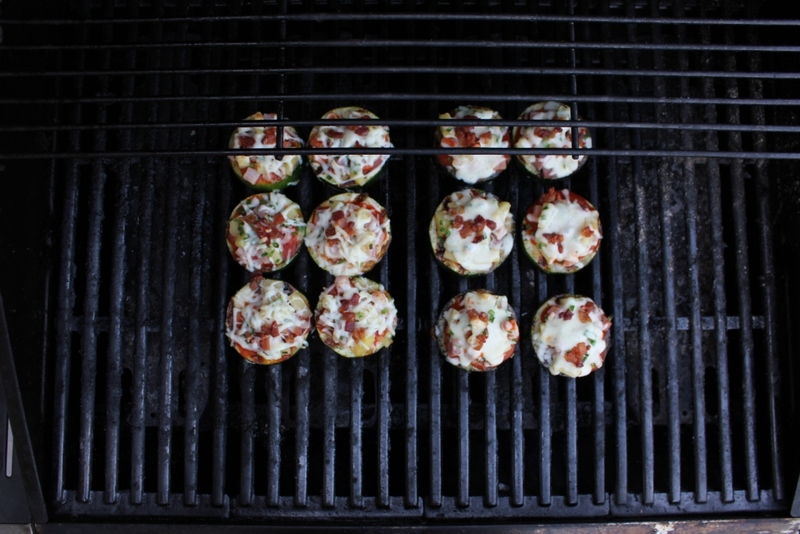 Its raining zucchini… actually its more like flooding…or maybe its time for pizza? Zucchini season is in full swing. 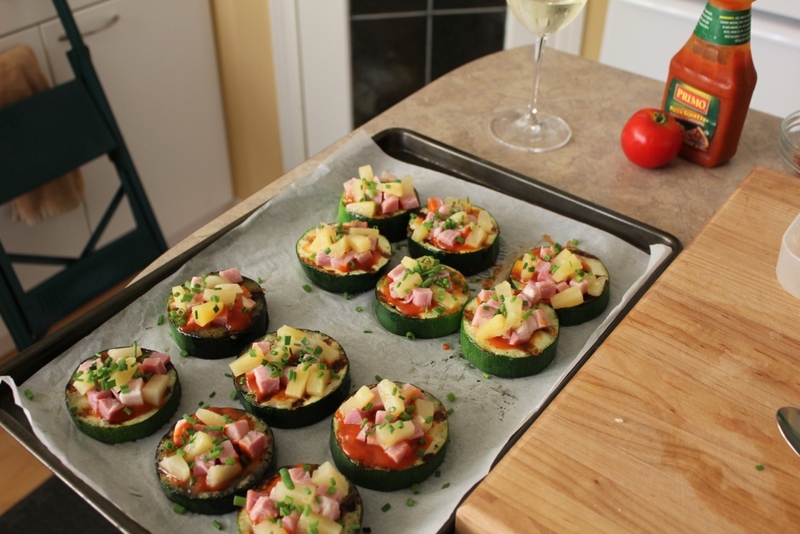 When I was looking up new zucchini recipes last week, I found that August 8 is actually ‘National Leave Zucchini on Your Neighbours’s Porch Day’ The idea was that you snuck over to your neighbour’s place and stealthily placed zucchini on their porch… this if your neighbour has a porch of course… or doesn’t have a gate… or a dog…. or ? I think that concept is more figuratively than literal, but I did have a good chuckle as I pictured myself dressed all in black, at night…. 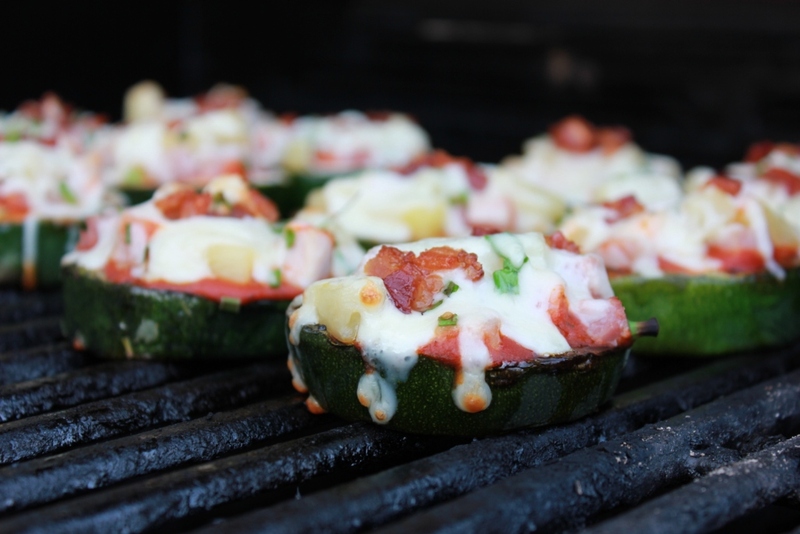 sneaking around with baseball bat sized zucchini…. What I did find was some great websites for recipes. 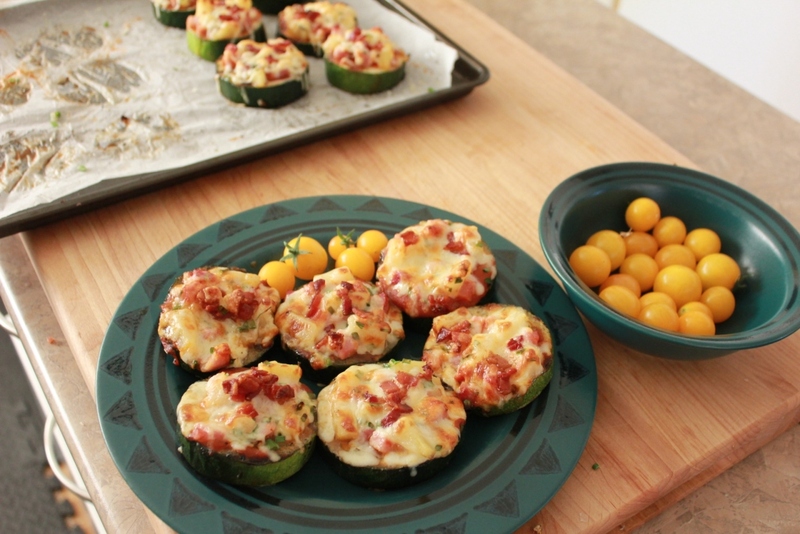 One gal had 20 ways to use zucchini. 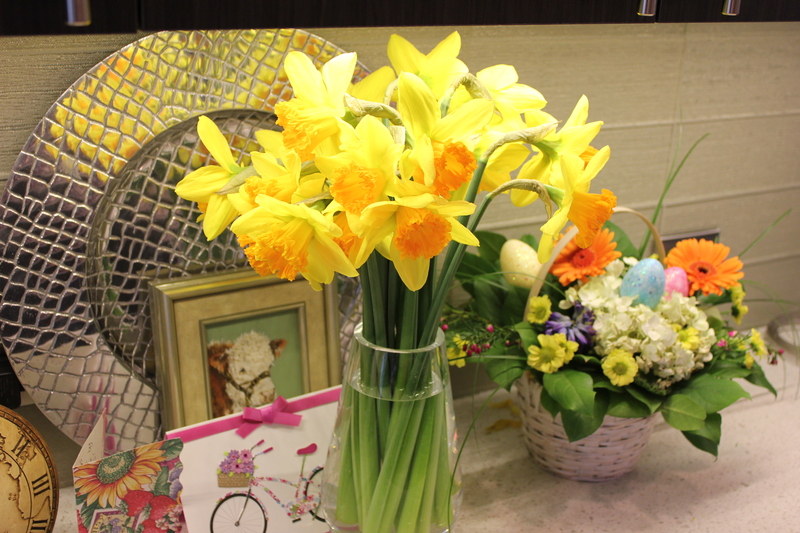 In amongst all of them I found a few that really caught my eye. This one seems to be the winner. I put up a brief description on FB already but thought I had better follow with a blog. 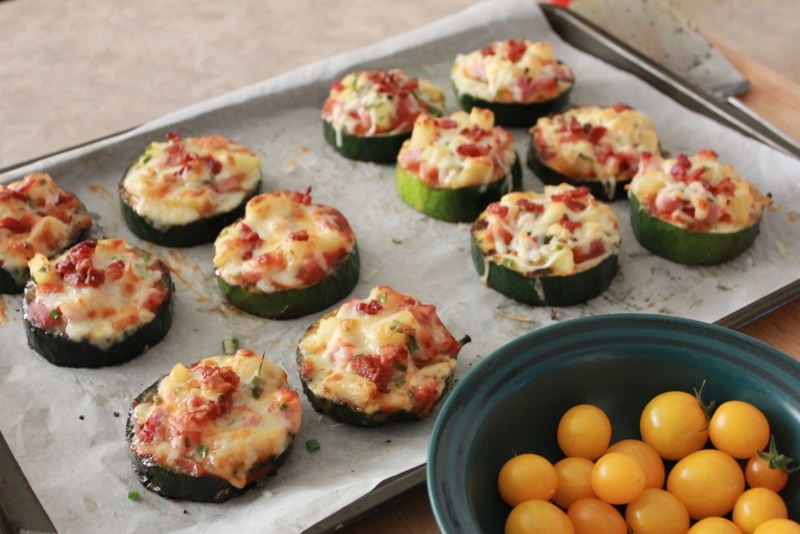 And the winner is zucchini pizza! 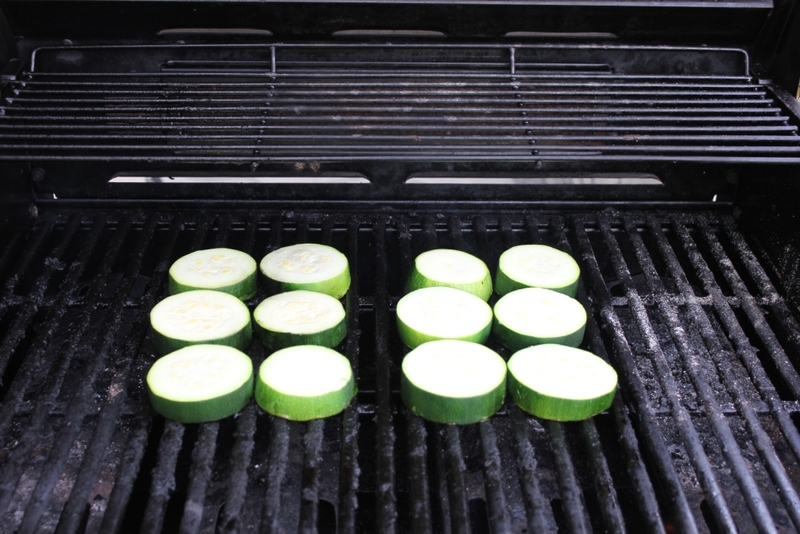 It’s really simple and works tremendously on the hot days as it’s all on the grill. 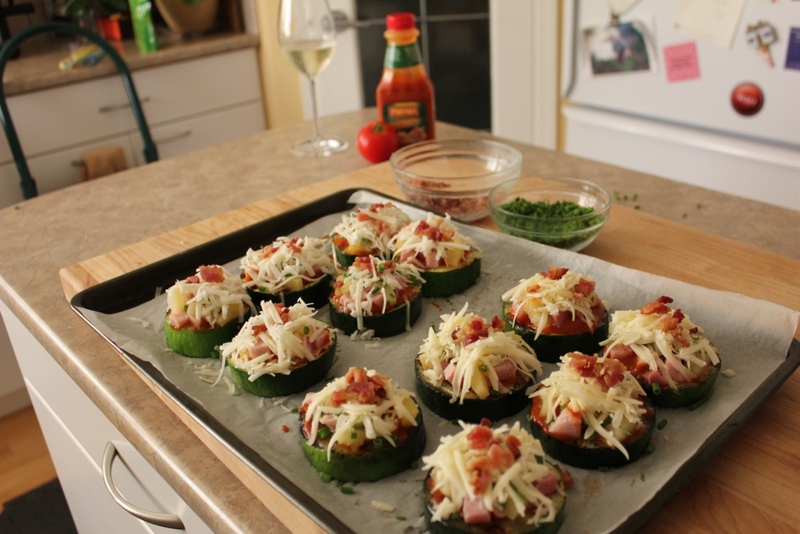 Most people have not picked zucchini at its prime when its nice and slender, so once it gets to about 3 inch diameter, its perfect for this. Any larger and the centre gets a little too weak. Get the grill hot and oil it for non-sticking purposes. Slice the zucchini on the round, about 3/4 inch thick. Grill for 8 minutes with the lid closed. 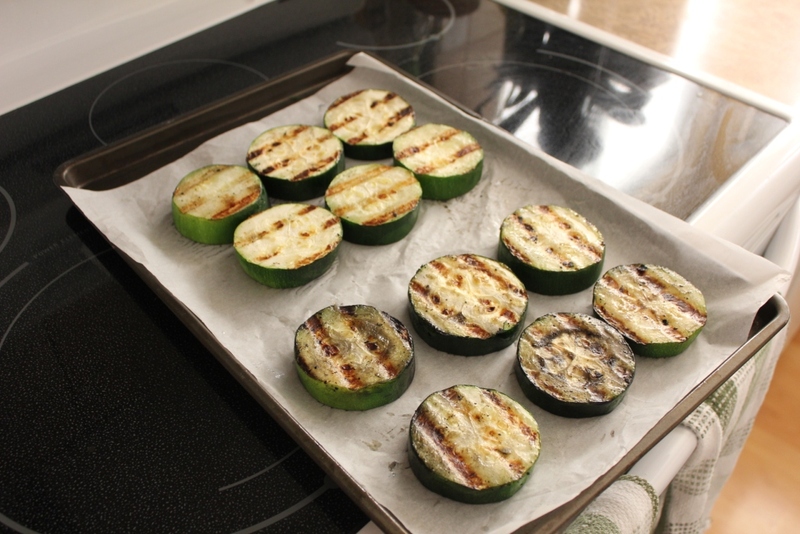 Remove the slices to a pan, grilled side up, and bring to where the rest of your ingredients are. I found it easier to just bring back into the kitchen to assemble instead of bringing all the ingredients to the grill. 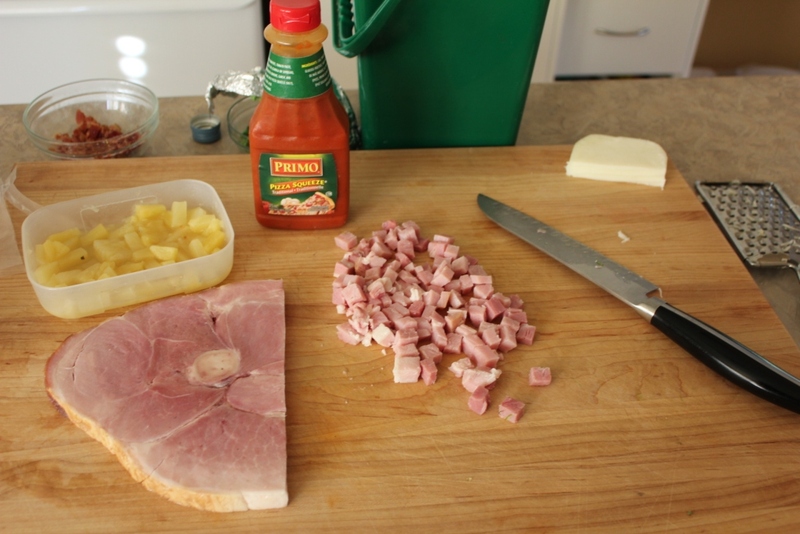 I started with pizza sauce, then added diced ham and pineapple tidbits.On this occasion I made 12, so I did 6 for Don and 6 for me. For his I used goat mozzarella. For mine just regular. 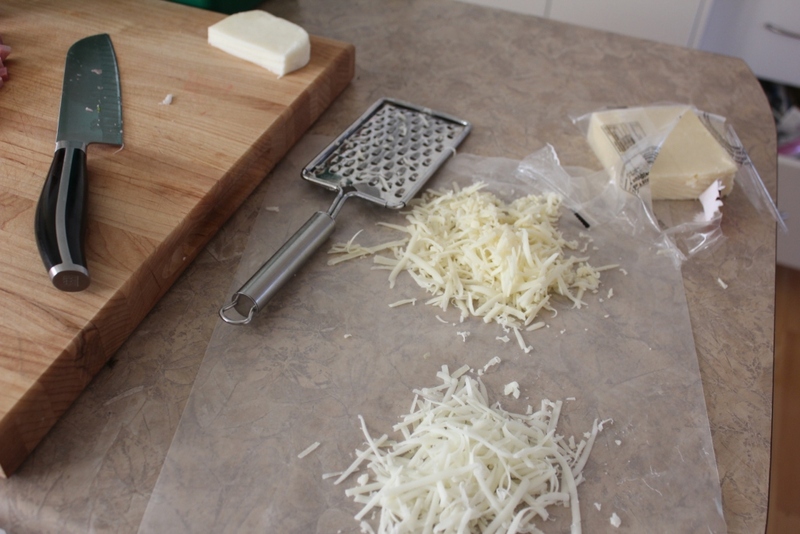 In the picture, the top cheese is the regular, cow’s mozza, and the lower stuff is the goat mozza. You can see that the regular one is more yellow… it’s because of the fat content….its higher. I have made mozzarella from scratch… (see one of my earlier posts) and the full fat mozza comes out far more yellow. I had some left over bacon bits and chives from last night’s baked potatoes, so I decided to add them to the tropical theme. Now they went back on the grill for another 8 minutes. I did them over low heat but had the other 2 burners on high. The grill then operated like an oven and the cheese got nice a browned up. And then they were ready to eat. Bon appetit. Vita-Mix, Rice cooker, Polenta and Parchment. You wanted GF croutons didn’t you? One time I even didn’t attach the lid on and had the nice green goop all over the kitchen ceiling. When they tell you to ensure that the lid is attached properly.. THEY ARE NOT LYING. Anyways… with the Vita-Mix, if you puree to your hearts content, the soup actually gets hot but not boiling so the enzymes are still alive ( which makes it healthy incase you were wondering). It has a 2 amp motor so it can whiz and whir like a commercial robot coupe. But back to cold soups… in order for things to be cold in the Vita-Mix, it is usually necessary to add ice cubes to the mix… or…. make the soup and put it in the fridge. So my next attempt is going to be a green gazpacho with ice cubes. You whiz it and then immediately serve it. Ideally it will taste OK as I am going to be serving it to company. I know, I am nuts. 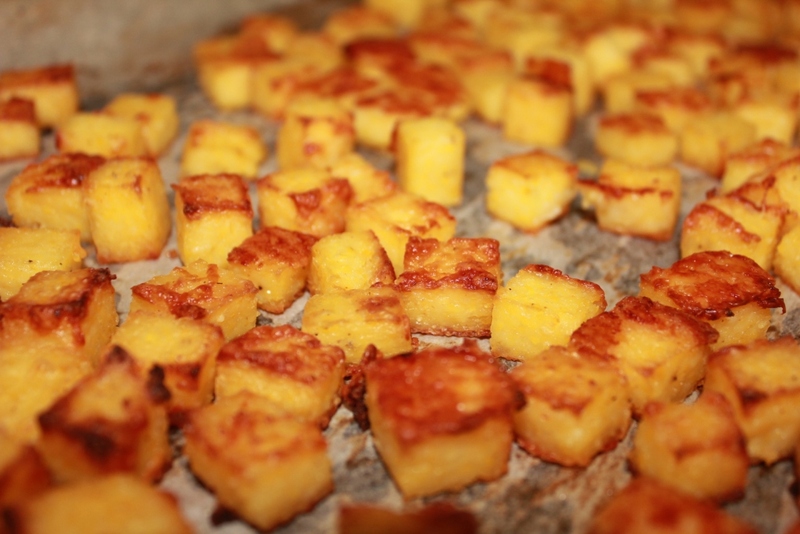 Well on one of the cold soup websites, one of the garnishes was Polenta croutons. As Don is GF, this seemed like a great idea. The only problem being is that you have to cook them at 450 in the oven and who wants to do that in the heat? Good concept, bad timing. 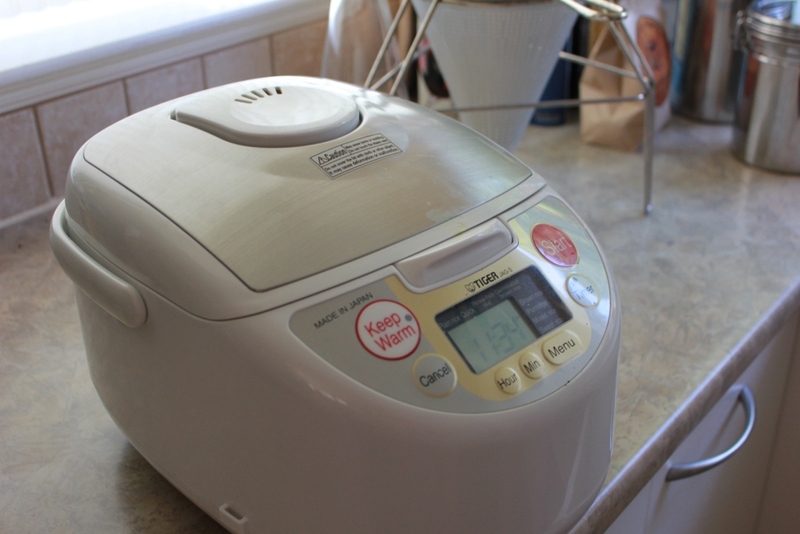 So I cooked up a batch of Polenta in the rice cooker. My cooker has a porridge setting which is the ideal one for Polenta. Just don’t forget to stir at least once. If you don’t, you will have goo on the top and crust on the bottom… not palatable at all. I set a timer for 25 minutes and give a really, really good stir to get all the lumps smoothed out. When it was cooked, I mixed in a bit of cayenne, olive oil and sea salt. Anyways, now I had Polenta and I had to find a time to heat up the oven that didn’t make the house unbearable. I laid it out on cookie sheet, shredded some hard goat cheese on it and stuck in the fridge and then proceeded to forget about it. But… that’s what worked. It got nice and coagulated and was very easy to cut into small crouton sized dice. I put them on a parchment lined cookie sheet and baked for 30 minutes, stirring them up twice. For a more crispy product, you could individually turn each crouton… I of course did not have that patience… the brown, crispy side was actually the down side. So now bring on the green gazpacho and we shall see if it all goes together. Will keep you posted. ah-nyuh-LAHT-tee… really? Agnolotti or priests’ caps… you choose. 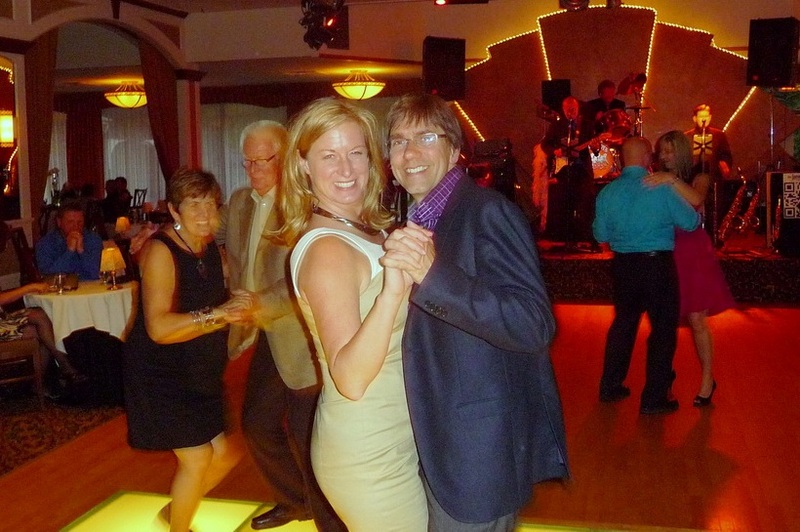 On May 11th it was my parents 50th wedding anniversary. It was also Don’s 49th birthday. 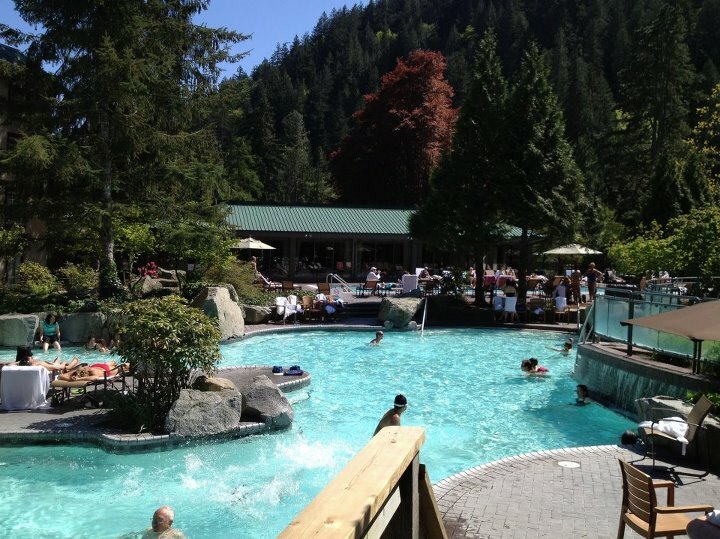 Our whole family… all 8 (plus 1, so 9 to tell the truth) of us headed to Harrison Hot Springs Hotel for an evening of good food, good dancing and a just an all round good time. On the menu was an Agnolotti. 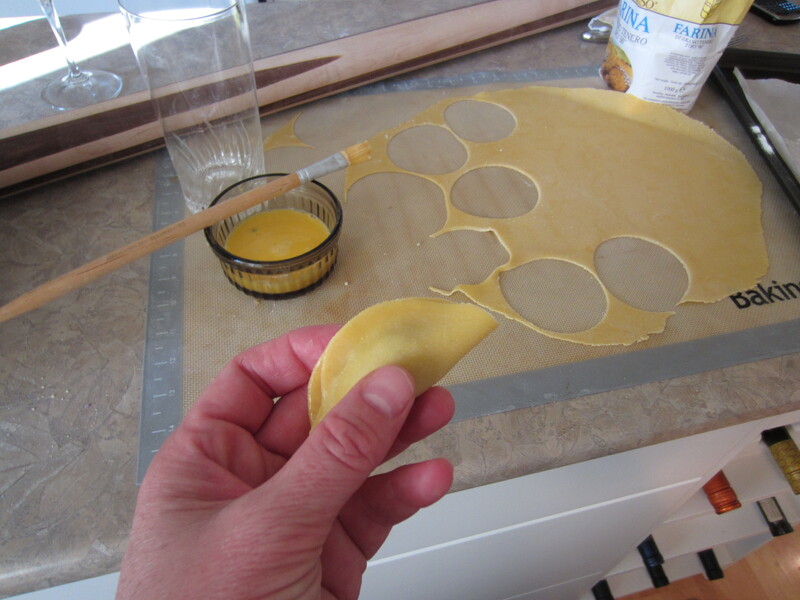 As I am the resident foodie, when one person in our party did not know what it was… I could explain that it was almost like ravioli except in crescent shapes. 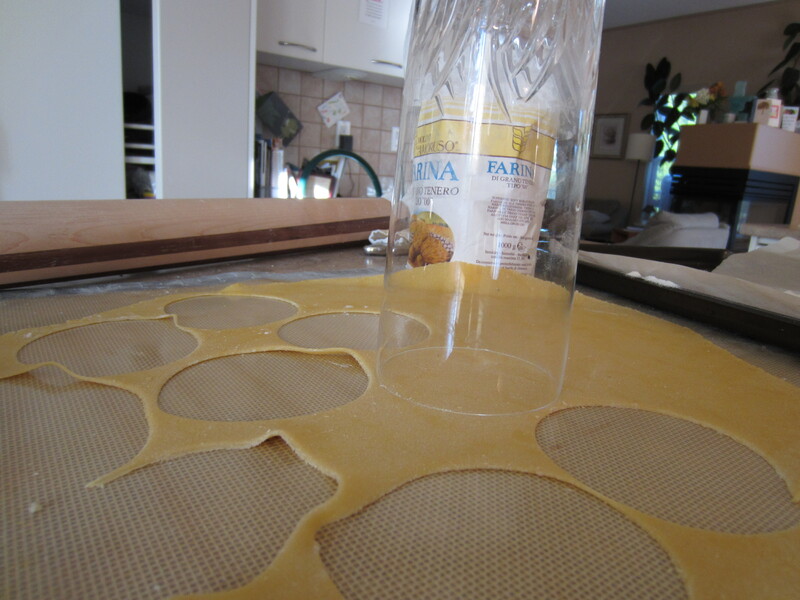 Agnolotti starts with a circle instead of squares as in ravioli. Its easier to make but has more waste because you cannot use up the portions in between the circles. With Don headed out on a boat trip for a few days, I took the opportunity to ‘flour’ up the kitchen. 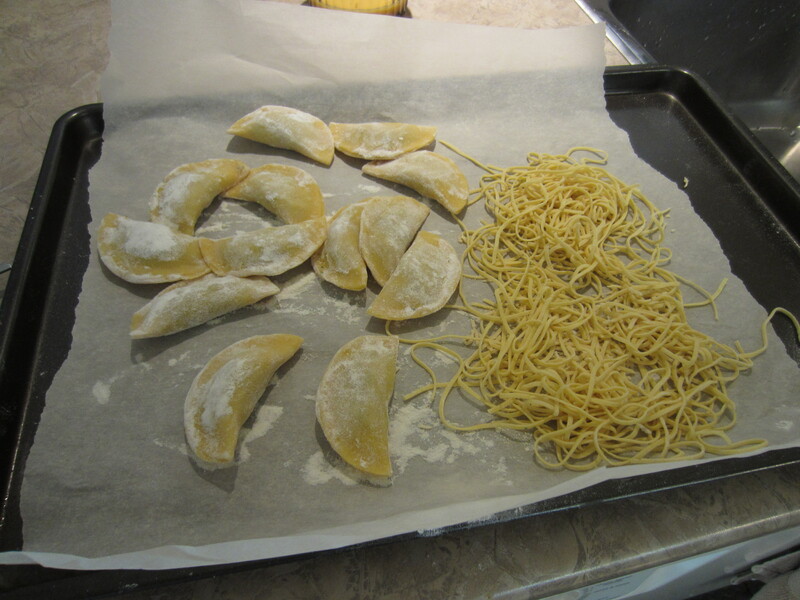 And what a better item to make than these crescent-shaped stuffed pasta. For the filling I used some swiss cheese, honey ham, red onion and arugula. I bound it with bread crumbs and bit of water. I used a crystal glass that had a fine rim to make the perfect circles, I put a small amount of filling on half, circled the edges with egg wash and then sealed. I think I will cook them with burnt butter and sage sauce…. With the left over ‘wasted’ pasta, I made some spaghetti. 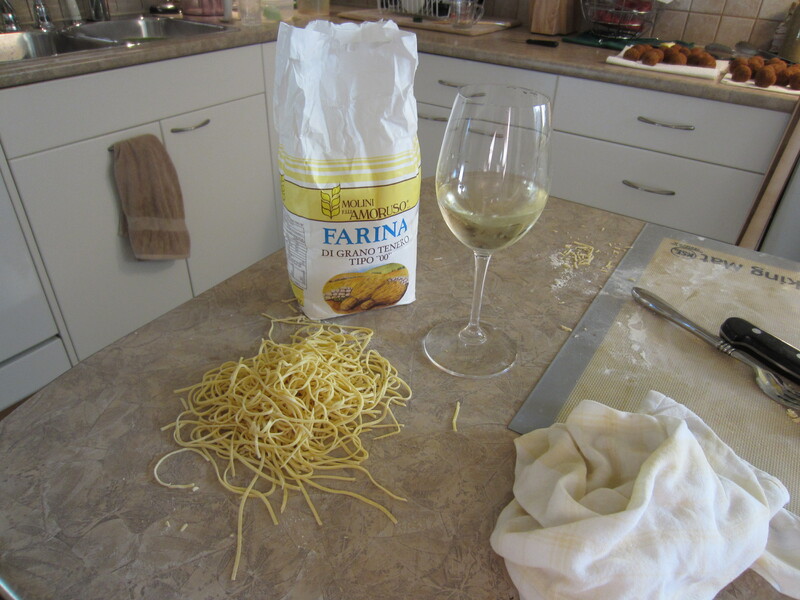 I also used my very cool pasta rolling-pin that Char made me. 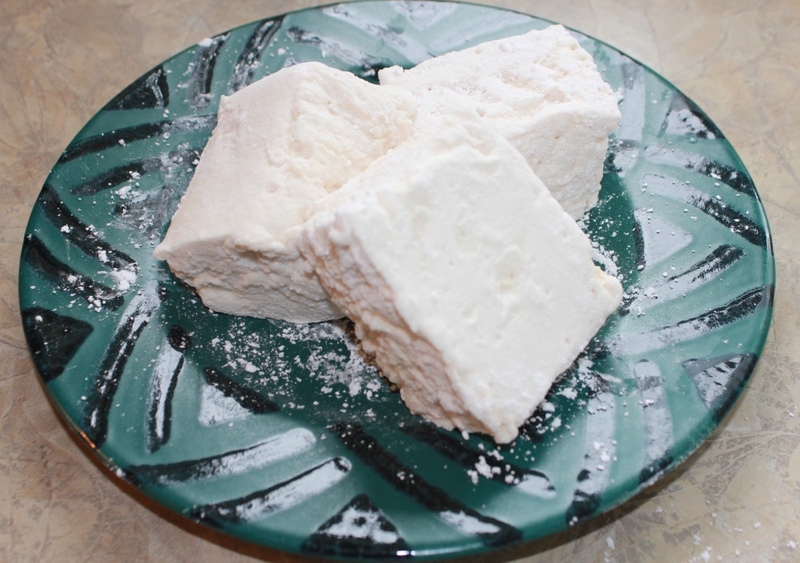 Icewine Marshmallows… or should I say Marsh…mellow…? My friend Carla Johnson, who hails from the greater Toronto region, is a fabulous writer and public speaker. When she was growing up her mother would add wine to the fo od that was being cooked and her Mennonite Granny, suitably horrified, called it ‘cooking with sin’. hee hee. Fast forward a generation and Carla pens a book that weaves recipes and stories together in a wonderful tale. Cooking with Sin is born. 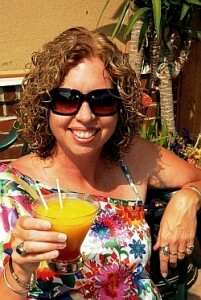 Occasionally Carla links to one of my recipes if it includes alcohol. Recently on her facebo ok page she had a link to a recipe for Icewine Marshmallows. This intrigued me. 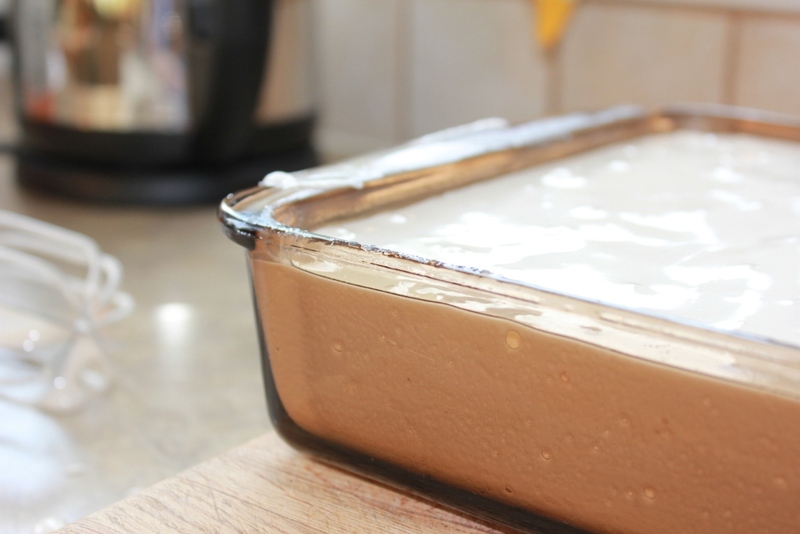 I had never thought about making homemade marshmallows…. why would I? We don’t consume that many of them but as I am always on the hunt to expand my cooking repertoire… I decided to give it a go. 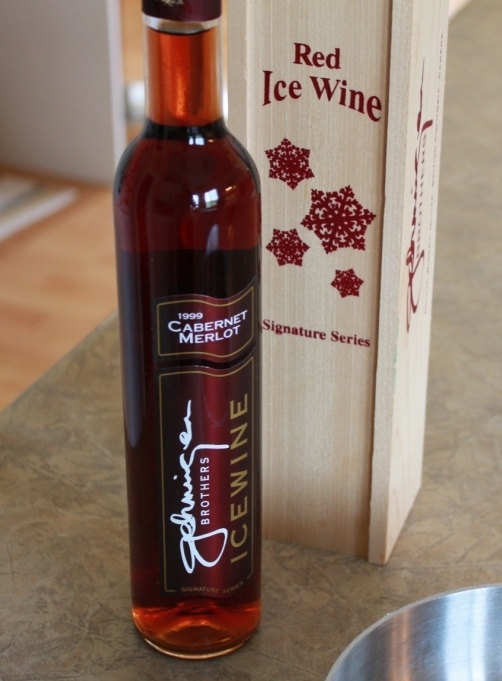 I have to admit I am not that much of a fan of icewine… I know, here in BC we make fabulous icewine… we have the perfect climate in our grape growing regions. Well I did have some icewine on hand, so it seemed like a very good idea to use it to try this out. 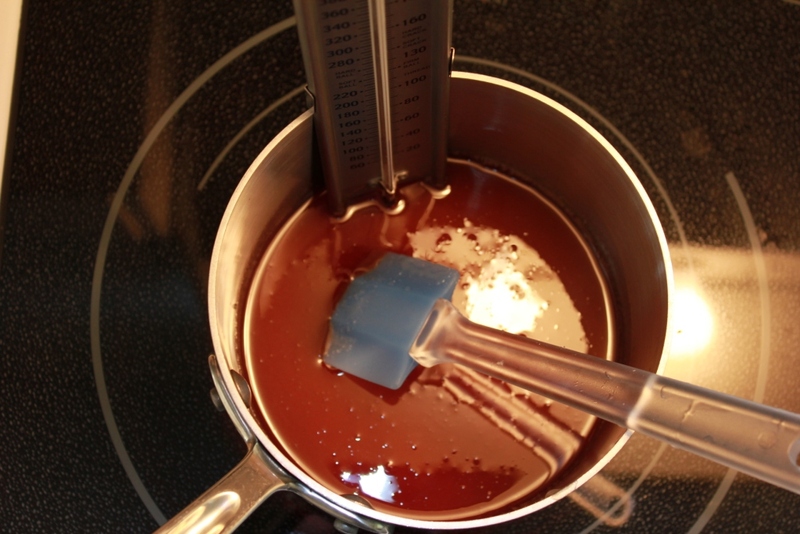 I had never made candy of any sort but had the most important tool….the candy thermometer. When I started the process, I was a bit nervous….but really… how hard could it be? So I dove right in. Marshmallows are basically sugar… and more sugar…. oh yah and corn syrup…. Guess this is why they are not that popular around here. First off you soak the gelatin. 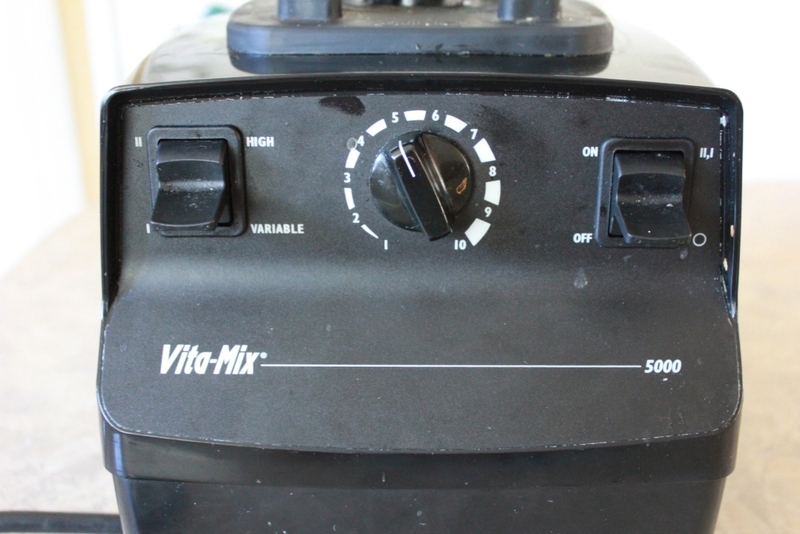 This is to be done in a stand mixer… I didn’t think I had one of these… I know… why wouldn’t I have a stand mixer? Well I don’t do much baking and so it never has been a priority. 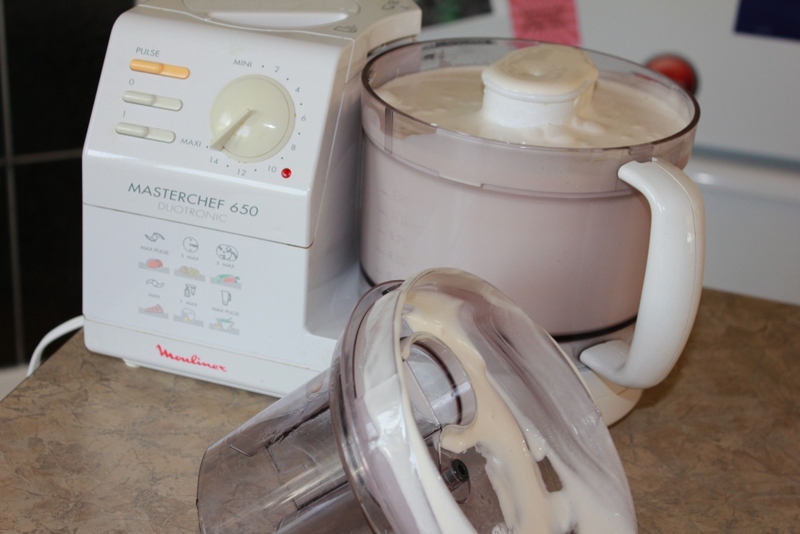 What I did find out is that my food processor has an attachment to turn it into a small stand mixer… and when I say small… I mean almost too small for marshmallows that is. It was quite funny. Marshmallow goop that expanded and took over the machine. But I am getting ahead of myself, first you have to cook the sugar, more sugar and the corn syrup and get it to what is called a ‘soft ball’ ?? 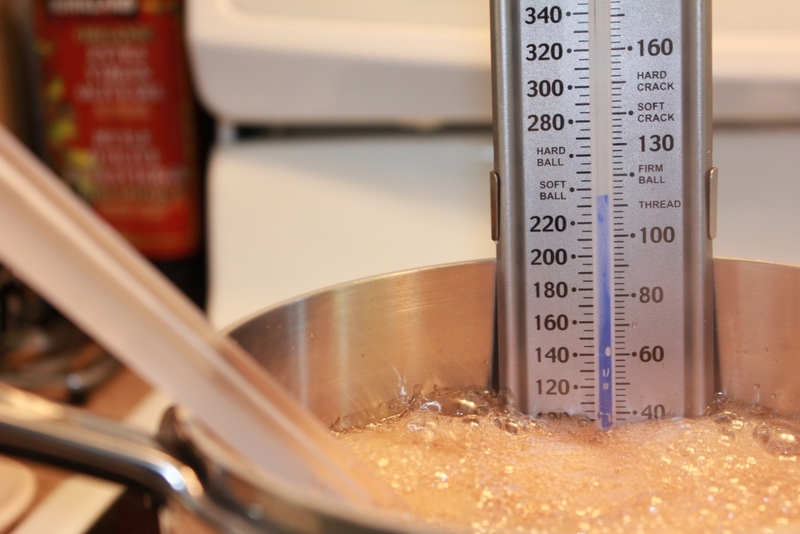 and what do you know… these exact words are on my candy thermometer! Goat yogurt never gets this hot so I always have ignored the wording on it. Now I know. It was definitely an interesting test. 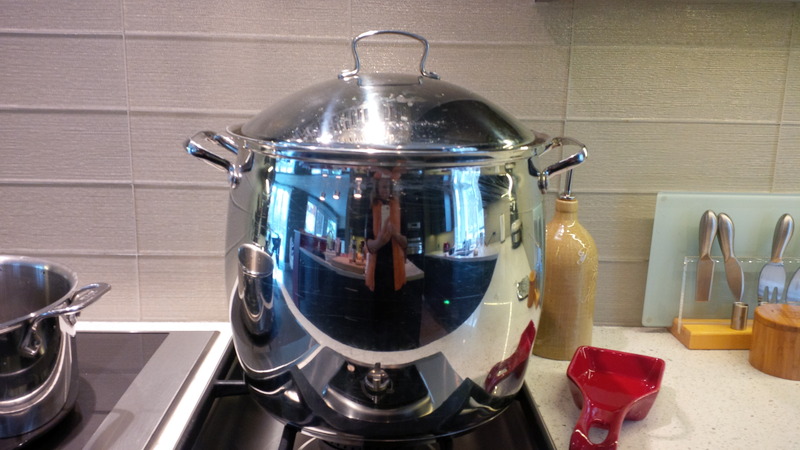 When the recipe says, use oil to coat the pan….they are not joking. When the recipe says coat the square marshmallows by dusting with icing sugar…. they are also not joking. Marshmallows are best described as ‘self sealing.’ When they are cut, they become un-cut if you don’t remove them from the pan. And the end result? They texture and taste was EXACTLY like a marshmallow…. well actually a marshMELLOW with icewine added to it…. Enjoy! Jason Parsons, executive chef at Peller Estates, says it can be challenging to cook with icewine, but if chefs are mindful of the alcohol content, they should be OK. Makes 12 squares. Place Icewine in a small saucepan over medium heat. Simmer until reduced to 4 tsp, watching closely to prevent scorching; cool. 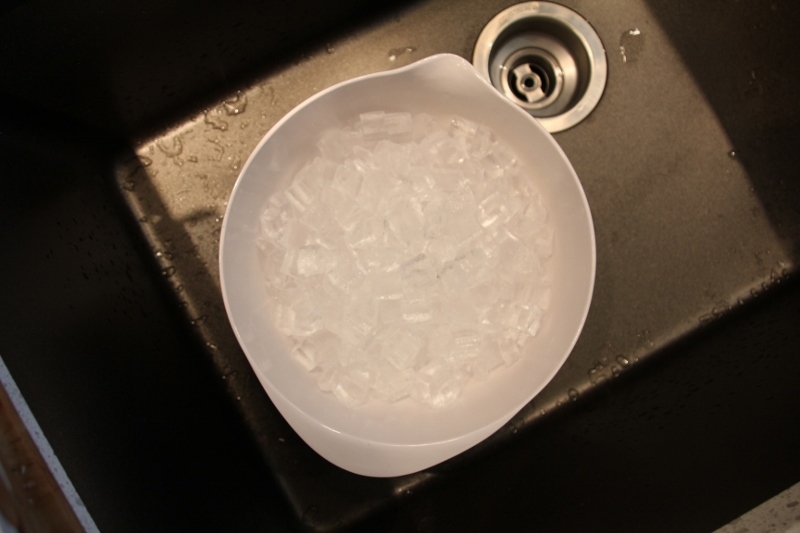 Pour half a cup of water into mixer bowl, sprinkle with gelatin and let stand 10 minutes to soften. 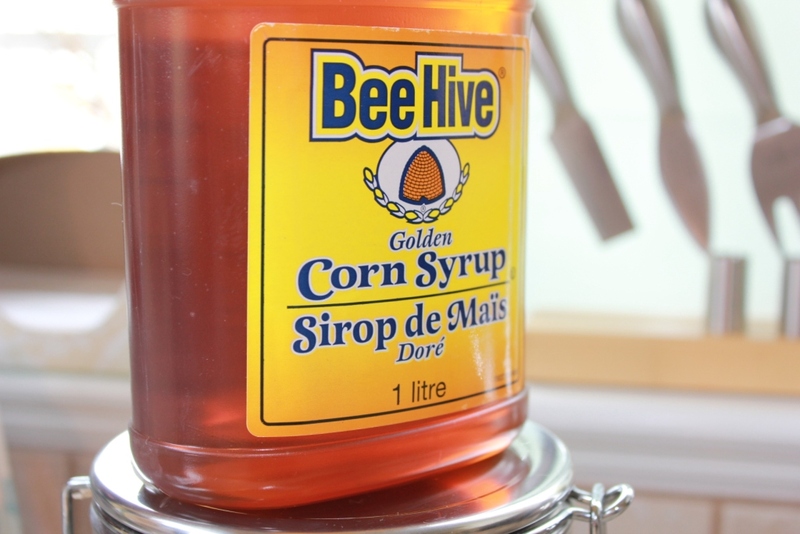 Combine remaining water, sugar and corn syrup in a small saucepan, bring to a boil then boil vigorously for one minute. Stir into gelatin mixture with the salt. Beat with whisk on high speed for eight minutes. Add vanilla and reduced Icewine and continue beating two more minutes. 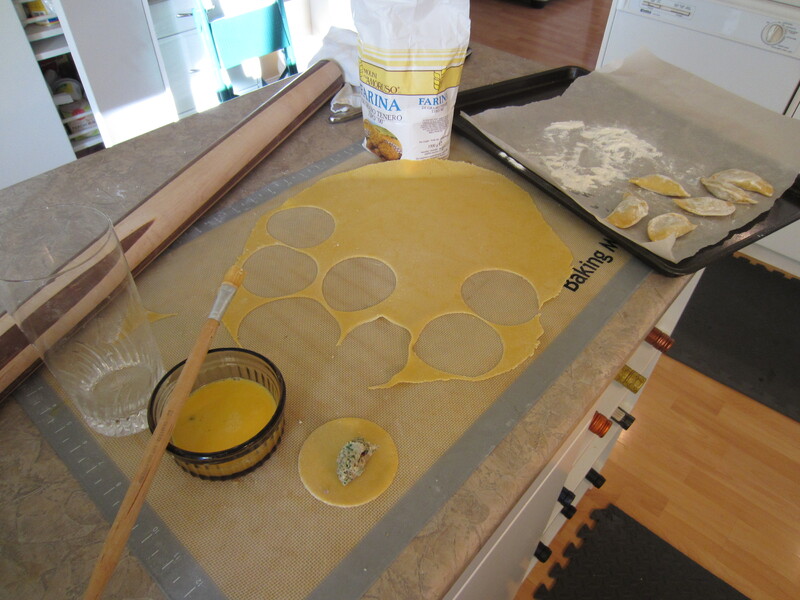 Transfer mixture into 9-inch square pan lined with oiled plastic wrap, using an oiled spatula to spread evenly. Allow to set several hours in a cool but non-refrigerated area. 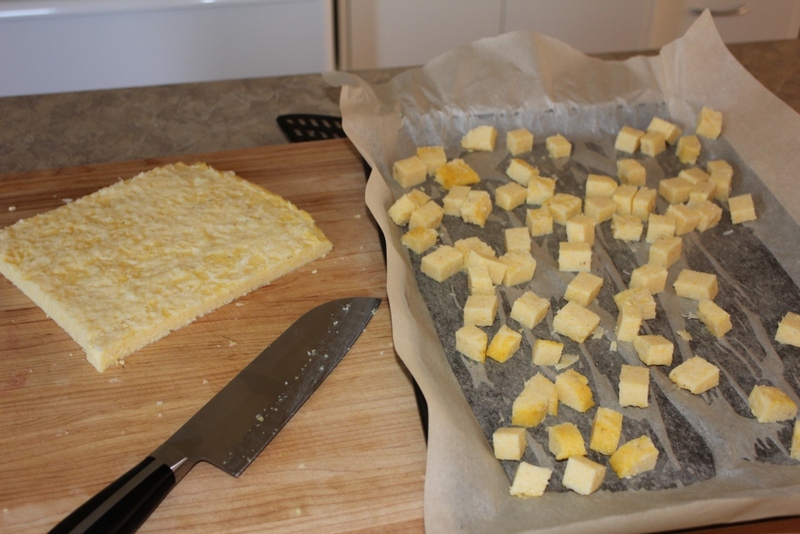 When firm, remove from pan, cut into squares with a lightly oiled knife and coat each square in icing sugar.